Police and family members in San Bernardino, California tell a reporter what they know in the immediate aftermath of an active shooter scenario. A tearful father waits for news of his daughter who had texted him to say she was caught in the scene of an active shooter at her workplace in San Bernardino, and was hiding with colleagues. 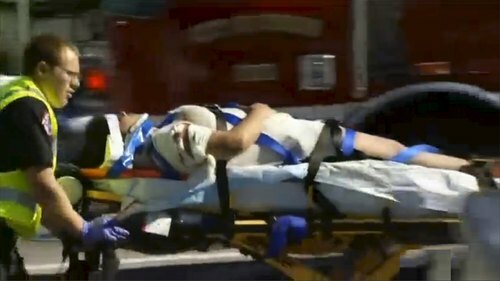 The L.A. Times published this video taken by a nurse at the Inland Regional Center. More U.S. residents applied to purchase handguns, rifles and other firearms from licensed dealers on Black Friday than any other day on record, according to Federal Bureau of Investigation data released this week. On Nov. 27, 185,345 applicants were processed through the FBI's National Instant Criminal Background Check System, which determines whether a person is eligible to purchase guns from a licensed dealership, the FBI said in a statement. large but we have absolutely no idea where they are." came prepared to do what they did as though they were on a mission." Police say officers have no exchanged any gunfire with anyone. Police say they do not yet have information from witnesses on whether suspects said anything during shooting. Police say they do not know if this was a "terrorist incident." 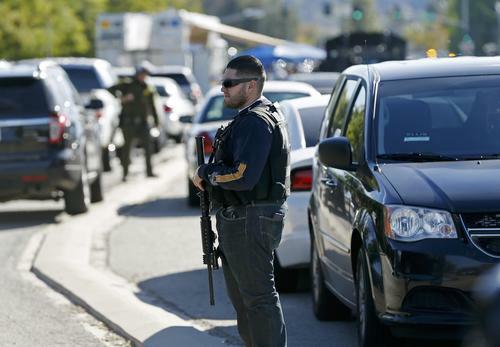 Suspects are still at large after San Bernardino shooting, police say. Up to 14 people are also injured, police say. Police say up to three people entered building and began shooting. 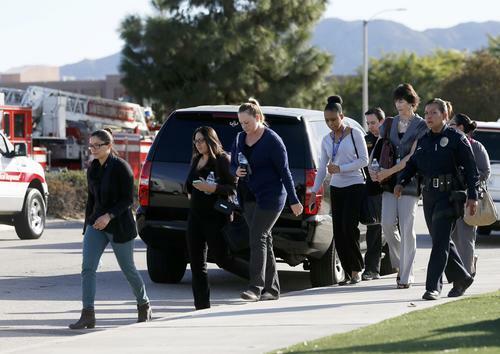 Kristina Lopez, an employee of Inland Regional Center, said she and several others sheltered in a conference room during the shooting. Lots of people gathered down the street from Inland Regional Center concerned about loved ones who were in the building. One person told me they were in the building for a Christmas party. Declined to say more. President Barack Obama on Wednesday called for a bipartisan effort "at every level of government" to address mass shootings, such as the one that injured as many as 20 people in San Bernardino, California. "We don't yet know what the motives of the shooters are, but what we do know is there are steps we can take to make Americans safer and that we should come together in a bipartisan basis at every level of government to make these rare as opposed to normal," he told CBS News. "We should never think that this is something that just happens in the ordinary course of events, because it doesn't happen with the same frequency in other countries," he said. "We have a pattern now of mass shootings in this country that has no parallel anywhere else in the world." 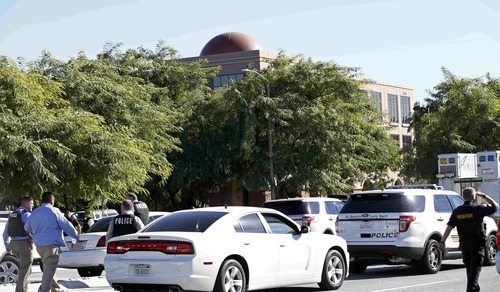 UPDATE: Inland Regional Center's executive director, Lavinia Johnson, says shooting was at conference center her group rented out for a county personnel holiday department, possibly department of health staff. "Police set up a quarter mile perimeter around the facility. On the northern edge of the perimeter what appeared to be workers at the Regional Center were being loaded Ito school buses and driven away. 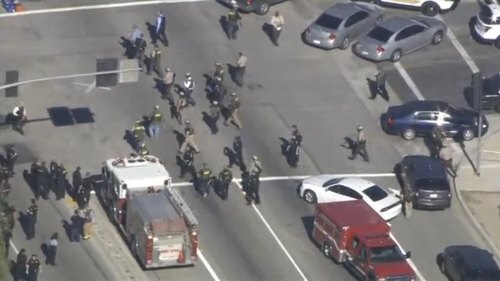 Dozens of police SUV vehicles from San Bernardino City and San Bernardino County were arriving on the scene nearly two hours after the shooting. 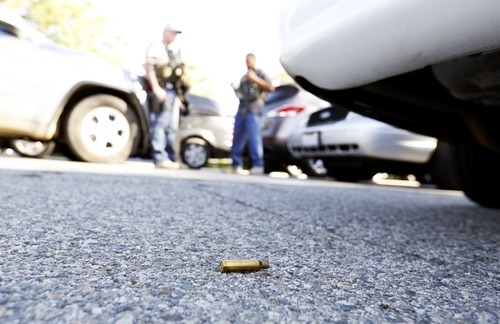 Also on the scene were agents from the FBI, and officers with the ATF, Immigration and Customs Enforcement." The Inland Regional Center, which was the site of today's shooting in San Bernardino, provides services to more than 30,000 people with developmental disabilities, according to its Facebook page. More than 300 people work at the center and, according to posts on the page, staff celebrated their Christmas party with the people they serve yesterday. The ICF Holiday Party is in full swing and SANTA is in the house! SANTA! UPDATE: Loma Linda Medical Center, on a recorded hotline, says it has received four adult patients and is expecting three more. 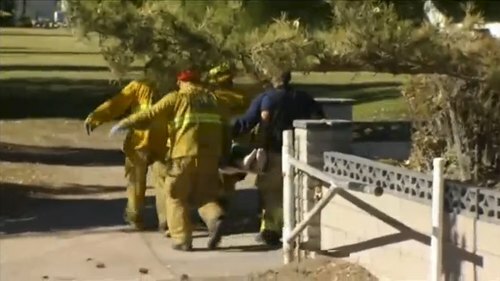 At least one person opened fire at or near a state social services agency in San Bernardino, California and authorities say as many as 20 people were wounded and at least three were killed. Rough Cut (no reporter narration). According to their Facebook page, the IRC is a facility that serves San Bernardino County and neighboring Riverside County in Southern California. Nearly 670 staff members provide services to more than 30,200 individuals with developmental disabilities in the two counties, the Facebook page says. The facility is run by the state, and offers specific programs designed for four different age groups: 0 to 3-years-old; 3 to 15; 16 to 22; 23 to 59; and adults over 60. 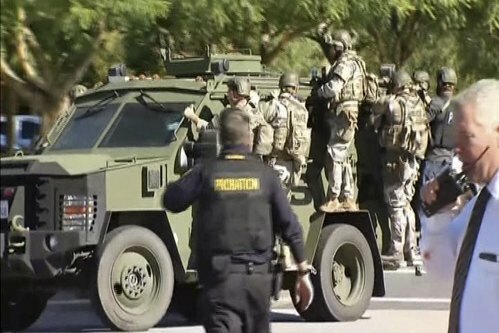 Heavily-armed police in Southern California respond to the scene of an active shooter in San Bernardino where early reports say 20 people may have been hit, possibly three killed. Mana Rabiee reports.